Running a business well is difficult and time consuming. Running an art gallery as well, at the same time, is an amazing feat of energy and ingenuity. That is exactly what Scott Bassett does every day as President of Pawsitively Bassett Inc., owner of Bassett & Brush Design, and the Wild Goose Fine Art Gallery. As if that isn’t enough, he is also one of the galleries resident artists! He’s worked in many mediums, but is currently focused on photography. Panoramic photography (as seen above) is his most recent passion. With a quick sense of humor, kind smile, approachable manner, and three dogs (Mac, Khai, & Tonto) all sleeping under the table, Mr. Bassett was fun and easy to talk with. Keep reading to learn more about Scott Bassett – Artist, Businessman, and all around nice guy. SnS: Welcome to TheSquidandSquirrel! I’ve visited your gallery, the Wild Goose and enjoyed your photographs many times. Now I’d like to know more about you, the photographer. So please tell me & my readers, are you a lifelong Spokanite? ScottB: No, I’m not native to Spokane. I was born in Chickasha, OK of all places. My folks were military and at one point my dad was stationed here, so I’ve been in Spokane since 1965. I consider myself an implanted native because this is home now. Before that, we were pretty much like wanderers because, you know, in the military you don’t ever really have a home. Of course I met and married a Spokane girl (born and raised) Tammy, and she had a big influence on my staying here, but I love Spokane. SnS: Well I’m glad you stuck around. So, have you always been creative, interested in art? ScottB: Pretty much! 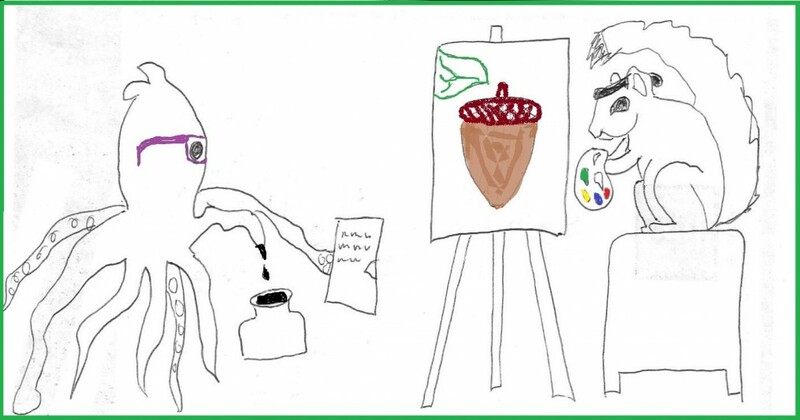 I’ve got a logo I developed that has a picture of me painting, when I was six years old. My mom took the picture. It’s an old black and white and I use that in my Scott Bassett Studio logo. My mom was very into the arts. She dabbled, and painted in oils and things like that. I was one of her artistic sons, the other was my younger brother, and she was good at letting us explore painting and drawing. I’ve pretty much drawn most of my life, until I got into graphics. Once I got into graphics I was more into design. I didn’t get to do a lot of drawing, and I kind of quit painting when the kids came along, ya know. Life just got too busy. I only did the occasional watercolor on the side. SnS: Did you go to art school? ScottB: I went to Spokane Falls Community College and at the time the Advertising and Graphic Design course included some art classes. I took Life Drawing and Watercolor, which I dearly love. I took Oils also, but the fumes got to be a little much. I tried Acrylics. That was a disaster. I’m primarily a pencil artist and watercolorist. My wife, Tammy, likes to tell a story that she sold one of my paintings for two thousand dollars, one time. After earning degrees from SFCC, we moved to the Puget Sound area where I landed a job. We lived on the coast, in Mt. Vernon, and I’d done a watercolor of a moored fishing boat, and hung it in our home. The boat was named Amanda, just like our baby daughter. It was moored and had oil tankers in the distance behind, and was very misty looking. SnS: *LOL* A logical and valid statement in my estimation. So pencil and watercolors were your mediums? ScottB: They are my mediums, along with photography. And now wood working, and glass cutting, and kinda everything, but I’m an old guy. I’ve had lots of years to gather skills. Things fascinate me and I just get sucked in! My art on the side was pretty sporadic since I got into designing. Until about three years ago, that is, when I became infatuated with photography. SnS: Tell us about your photography. ScottB: I’ve always had a camera and been interested in photography, and for the last 30 years I’ve worked as a product photographer for our clients. Shooting photos of “widgets”, or hair spray, or whatever. Package design was my company’s forte for a while and we handled clients like Nat Geo and Disney, creating packaging designs for them. Eventually though, packaging took it in the shorts. It started to shrink as an industry once downloadable software came out, but we saw that coming and trained ahead for web design. What got me going in panoramic photos though is some property we own up in Pend Oreille, along the river. We leave the property mostly undeveloped because we like it that way, and I carry my camera every time we go up there. I just sit there and shoot stuff like a mad man. Panoramic images really fascinate me, so I started shooting panoramic, which is multiple shots that you then recombine to create one image. You have to do that because digital cameras don’t have the dynamic range of the old analogue cameras that used film. Film is amazing, I mean it really is! But it’s also very demanding, and you’ve got to really know your stuff. The digital cameras are limited though, so you have to do multiple exposures to get your shadow detail, and your high light detail, and mid-tones. So you you have to work with a tripod and shoot one section of your panoramic, then you move your camera to shoot another bracket of images. Then you move it again and shoot another bracket, until you have the whole scene as you’ve envisioned it. Then you go in Photoshop and put it all back together. It’s kind of time consuming to do it well, and get the color balance correct and all the images seamlessly matched. It just drives me nuts, but I love it! So when I get done, I go ‘All right, it worked!’ Then I print it out and do the happy dance. SnS: Do you remember shooting your first panoramic photo? I drove up four days later to take the photos and all the leaves had fallen. Oh geeze I cursed, but I figured I was up there so I took the photos anyway and it turned out to be a really cool shot, because all you got were these white birch and aspen that created a picket fence thing across the far end of the field. So that was my first real panoramic. SnS: So what made you decide to start drawing on your mats? So that got me thinking, and I started doing pencil drawings to print on the mat boards. I do the drawing by hand and try to pick a subject that relates to the subject of the photograph. For Tammy’s field, I took reference photos of the fence post I’d leaned on, then did the drawing in pencil and put that on the mat board surrounding the photo. SnS: What a great idea! And framing? How did that happen? ScottB: So, I’m thinking I was being really cool with the mats, really top notch, but a friend of mine named Bob Brown, who’s a real wizard in the wood shop said, “You really should be making your own moulding.” Bob is my woodcraft mentor and taught me fine wood crafting. You can see, I’m easily influenced. After that, my hand crafted fine art prints took on a life of their own. Now I build my own hardwood mouldings and frames, hand mount and lacquer my photographic prints, cut my own glass and mats, and finish them with a dust jacket on the back. The whole nine yards. Then each is signed and numbered with an artists certificate. I’m a bit OCD about it, but that’s what I pour my passion into. SnS: That passion is obvious. Your work is beautiful. What made you open the Wild Goose Fine Art Gallery? I mean, you’re a busy guy running a successful business and all. ScottB: I was running out of room in the house! I did some art shows. We got the tent, grid panels, all that, and I did three or four shows one summer and thought, good grief, this is gonna kill me. I’m too old for this crap. So I started looking to get into galleries. I got into one in Priest River, ID and sold a number of pieces there, but I just couldn’t find the time to approach galleries. Plus many of them were backlogged with lists of artists waiting to show there anyway. She always comes up with brilliant ideas, and I always take them and go overboard. So on October 1st of last year we began to clean this place out. By the end of six weeks, we’d emptied it, painted it, and fixed some things. On November 1st I called my friend T. Kurtz, who is an amazing pastel artist, and said, “Help I have a naked gallery!” Then I asked her if she’d like to come hang with us, and she said yes. So I said, “If you know any other artists that you are comfortable with, as far as the quality of their work, could you bring them?” We ended up having 14 artists from around the region displaying here when we opened, and the place was packed with stuff. I’m amazed at the quality of the artists that have come. In addition to T. Kurtz we have work by Shannon Potratz, our other resident artist here at the Wild Goose Gallery. There’s Gabe Gable – a nationally renowned bronze artist, Elizabeth Billups’ beautiful oils and prints, amazing watercolors by David Gressard, quilt art by Tammy Bassett, fine wood craft by Bob Brown, and the list goes on and on. SnS: That’s quite the group. How many artists do you usually have displaying in your gallery? SnS: You said that Tammy, your wife has some of her quilt works here also, right? ScottB: Yes, she’s very talented, in many ways. She teaches Preschool, draws – even though she says she can’t – plays the piano, and quilts. She’s been quilting for about 15 years, and she’s made some beautiful things! SnS: I’ve seen some of her work. It is beautiful! I admire anyone who can use needle and thread. If I tried to someone might lose an eye! *LOL* What artists did you admire growing up? ScottB: I admired Mark English. He’s an illustrator in New York. I loved his work. Initially, I wanted to be an illustrator for books and magazines. That was kind of where my heart was. I also loved animation and thought I wanted to work for Disney. That was back in the cell days, ya know. I decided I didn’t really want to work for Disney because I’d have to live in California and that just wasn’t for me. So I gave up on that idea. Andrew Wyeth was another one of my favorites. I love his work. And Maxfield Parrish, he’s almost an Art Deco illustrator of books and magazines. If you look up his work you’ll probably say, “Oh I’ve seen that guy!” Those are the ones I thoroughly enjoyed. I never understood Picasso. I just do not get him. I like Modigliani because he did such weird distorted stuff. In my odd moments I liked to play with that sort of thing. SnS: Scott, you are such a busy guy! What do you do to relax? Do you relax? ScottB: I usually take naps. Actually to relax, I go up to the river property. Tam and I go up every chance we get. It’s close enough that we can get there pretty fast, and once there it all melts away. I love being up there. We’ve left the property mostly undeveloped and we like it that way. We walk up and down, watch the snakes in the grass, the geese on the river, the cormorants on the pilings. It’s where we decompress. We’ve enjoyed the inside passage cruise to Alaska too. It’s just beautiful! And because it’s inside passage, you don’t have all that wave action. I don’t do well with that. We also used to do a lot of ball room dancing: fox trot, jive, and cha cha. Those are probably our favorites. I can’t do tango. I get serious and Tammy starts laughing. SnS: Ballroom dancing. What got you into that? ScottB: My folks got us into it. They were very big in the Round Dancing movement and taught for many years. Round dancing is a spin-off of Square Dancing. It’s Ball Room, but cued. Pre-choreographed to a certain piece of music, a caller will cue you through the maneuvers. My mom could cue a dance from the floor while she and dad were dancing. She was an amazing lady. So we started dancing with them, and when they got older and to the point of not being able to cue and dance, Tammy and I started demoing dances for them. So basically we were Junior Associate Dance Teachers, and we did that for about 15 years. It was great fun. So for us, fun is going on a cruise and dancing! SnS: Well that segues nicely to my odd ball question. . . If you could travel anywhere, with anyone (living or dead) where would you go and who would you take? We would pack up a trailer of some kind and start going around the U.S. We’d stop someplace and explore, move again and explore, just go see the U.S. I have no desire to go overseas. We’re happy here. I mean, why go there when we haven’t even explored everything at home yet? SnS: Understandable. Did you do anything fun over the holidays? ScottB: I played Santa Clause for about 100 families at Tammy’s preschool. She runs the North Side Learning Center. SnS: **Looking at his closely clipped beard and lack of moustache** So did you grow that out for the event? ScottB: No, I used a false beard. In fact the reason I don’t have a moustache is because it’s a little bristly and Tammy won’t kiss me when I have one. So either don’t do the moustache, or don’t get kissed, and smooches are kind of important. SnS: That they are. So what’s happening at the gallery this month? ScottB: Right now we’ve got Robert Walton’s work in. He does what I call Romantic Western. It’s like, if you could sit and make up a picture of something western, then just embellish it so it’s just so cool and charming, that’s Robert. That’s what he does. He does some really cool stuff! Things like Christmas steam trains traveling through snowy river gorges. He also has work licensed by Leaning Tree Publications, which is where most people have seen his exceptional artistry. Robert is very talented. SnS: As are you, sir. And your wife, and apparently most of the people around you. Thanks so much for interviewing with TheSquidandSquirrel. Coming soon – as promised! So, holidays over, let’s try this again. Coming tomorrow – an interview with SCOTT BASSETT ! !